AudioGo is the UK’s leading audio book publisher and retailer and also ‘The home of BBC audiobooks’. They literally have hundreds….thousands…of titles for adults and children alike, you could almost certainly guarantee something for everyone. All their audiobooks are available for download (you can download as many times as you like, to as many computers as you like, and transfer to as many listening devices as you like! ), or if still technologically challenged, like myself, you can purchase them in CD form. Obviously an absolute classic and well loved story read by a British film legend! This is proper vintage Beeb! Taken from the BBC TV series of the 1970’s with the beautifully waffly and fed-up sounding voice of ‘Captain Mainwaring’ reading the stories Mr Funny, Mr Dizzy, Mr Bump, Mr Fussy, Mr Topsy-Turvy and Mr Small! 30 nursery rhymes and songs of the lively sing and play-a-long variety! Four year old Bean was very excited to receive the CDs. He has recently been learning the story of The Wizard of Oz so was keen to sit and listen to that one. But Roo, who is two and a half, instantly recognised the Mr Men on the cover and demanded we gave that one a go first. Both the older boys love the Mr Men series and frequently read the books for bedtime stories. Bean sat and chuckled his way through all the stories, but Roo was confused and wanted to know where the picture was! At his age, I think he needs the visual of a book to relate to the words and to engage him. The Wizard of Oz disc moved things up a gear. It is an abridged version of the original text – so doesn’t really read at a level my youngsters could follow easily. Bean gave it a good go and although didn’t manage the whole story in one sitting he enjoyed it well enough. With his big brothers packed off to nursery, baby Happiness finally got a look-in and we could enjoy The Wheels on the Bus. Happiness does like a good sing and dance, so was more than happy to bop along to some familiar tunes. It has a good mixture of up-beat rhymes and songs and is all very jolly as you’d expect. 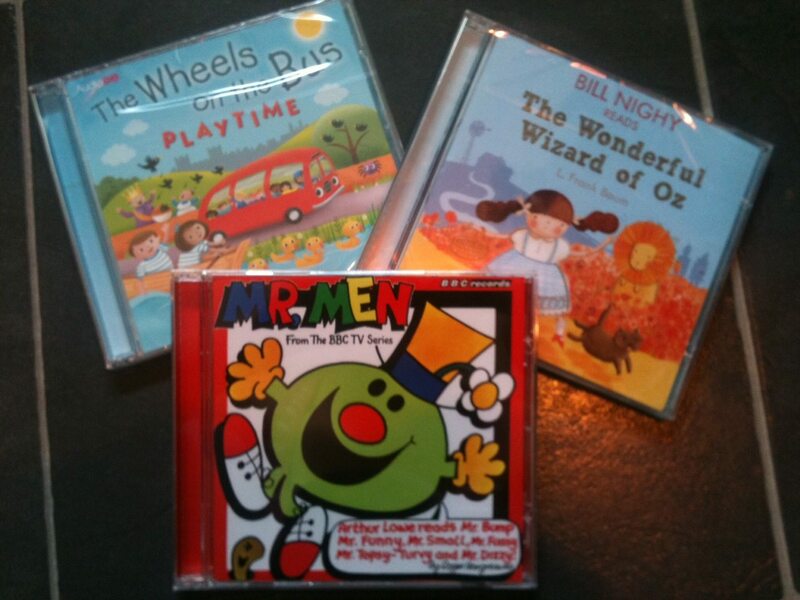 The Mr Men CD threw me right back to my childhood! I loved hearing Arthur Lowe’s voice and remembering how much we enjoyed the series as kids. It’s always lovely to be able to share those kind of memories with your little ones. I also enjoyed watching Bean listen to the stories, getting absorbed in them and chuckling away. But at 2, Roo is a bit young and/or too easily distracted to sit and listen without the visuals. I was more than happy to introduce Bean to ‘..Oz’, and I loved the fact that it was the original text rather than a “babied down” version. I was also chuffed to see it was read by Bill Nighy – he has a wonderful voice…but those two combined did mean it was slightly harder to follow. Bill Nighy also has a deeply soothing voice, so I found myself drifting off! Every few moments, I would check in with Bean and ask him what was happening in the story, and to my surprise he was following it very well. As for nursery rhymes, well, they’re not really to my taste – I sing the odd one to the baby. I do my motherly duties at playgroup and join in. But when we get home, it’s not normally what we choose to sing and dance around to….I don’t think it matters how well they are done, you can only stand so much!! Having not previously considered audio books, I am now excited about what to get next! I didn’t realise my 4 year old would sit so quietly and listen so intently, and was impressed that he did. I don’t think I would recommend the story CDs to little ones younger than 4, but certainly the older my boys get the more stories we’ll enjoy. What do you think of Audio Books? Do you use them? Do you like them? We were sent the products for the purpose of review, all opinions are our own.